Are you looking for natural face products to exfoliate, energise and renew a dull complexion? 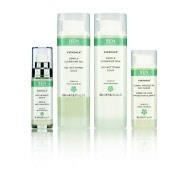 Then try REN Radiance Skincare Collection to perfect the skin's surface without using any harsh chemicals. 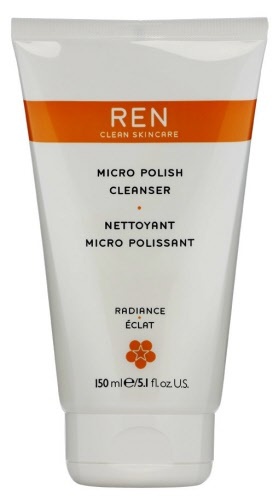 Using REN Radiance Skincare you will experience an intensive cleanse and exfoliation to reveal a smoother, more luminous even toned skin. Why choose REN Radiance over other REN skincare products? If you lack radiance, have a dull complexion, experience hyperpigentation and congestion then REN Radiance products will combat these issues. This range will also target scaring, dry skin, fine lines and enlarged pores that often can harbour bacteria. REN Radiance Skincare will provide a wealth of goodness for your skin. For a start you'll find a more radiant complexion by ridding the surface of the skin of dead cells. REN Radiance will also target imperfections and reduce cohesion between dead cells to decongest. REN Radiance Micro Polish Cleanser soothes, restores radiance and resurfaces skin imperfections. Experience smoother skin and finer lines with REN Glycolactic Radiance Renewal Mask. 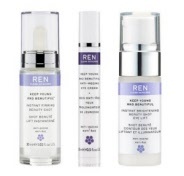 REN Radiance Wake Wonderful Night Time Facial smoothes wrinkles, protects and repairs damaged skin. REN Radiance Perfection Serum will correct the skin tone, lighten pigmentation and boost radiance. REN Radiance Satin Perfection BB Cream firms, protects and blurs imperfections on the skin.